Yesterday the market celebrated Congress passing a deal to avoid another government shutdown but we sill have another hurdle to clear, the presidents signature. He has remarked that he doesn’t like the deal but has also said he doesn’t think there will be another shutdown. Markets are higher around the world on hopes that US/China trade talks are progressing positively. Although there has been no news of progress the president seems to have softened his tariff deadline. Talk about keeping the market on the edge of its seat! Futures are bullish this morning ahead of a big day of earnings and a potential market-moving CPI report out before the open. The bulls are large and in charge and trend continues to rise but I continue to see signs of diminishing momentum and some overbought conditions. Stay bullish but stay focused on price action clues of weary bulls and profit-taking. This late in the rally be careful not to overextend and remember to take some profits along the way! On the Earnings Calendar we have a very big day with 170 companies reporting. Among the notable reports keep your eyes on, AIG, FUN, CTL, DBA, EQIX, FOSL, DLPI, HCP, HLT, H, KGC, LPX, MRO, NTAP, STAG, SPWR, WCN, WMB, WH & YELP. After a big day up as the market responded to Congressional deal to avoid a shutdown. Now it’s up to the President to sign it and although he says he doesn’t like it he also said he doesn’t think there will be another shutdown. Let’s hope he does sign it because if not the market will be very disappointed and react negatively very quickly. 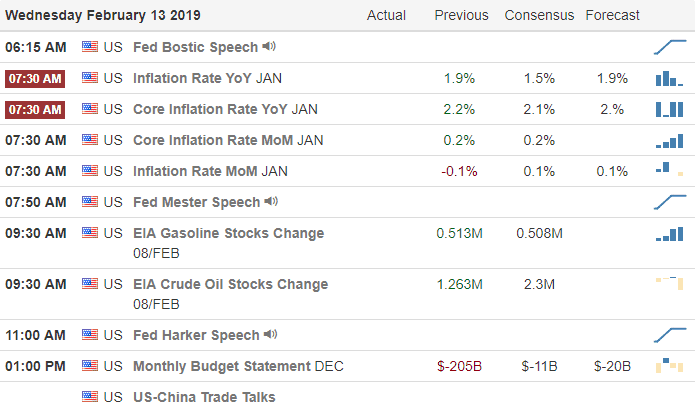 Today we have a big day of earnings and a CPI report for the market to chew on before the open. The Asian market and European markets are bullish on hopefulness of US/China trade negotiation progress. To my knowledge there has not been any news on the subject other than President has mentioned he may soften his tariff deadline position. As a result, Us Futures currently point to a bullish gap up open. I plan to remain bullish on the market as long as the trend holds but with T2122 pegged near 100 I also want to careful not to overextend with long positions.